Hillyard Mariner Acid Restroom Cleaner is a special acid cleaner designed to tackle the tough soils typically found in restrooms and shower rooms. It has dual acid formula works quickly to dissolve soap film, body oil, hard water deposits, urinary salts, and more. Mariner Acid Restroom Cleaner is perfect for cleaning ceramic tile, porcelain, stainless steel, and chrome fixtures. It can be used in traditional spray bottles to clean fixtures, sinks, toilets, urinals, partitions, and more. Simply spray it on, allow the product to dwell, and then wipe. 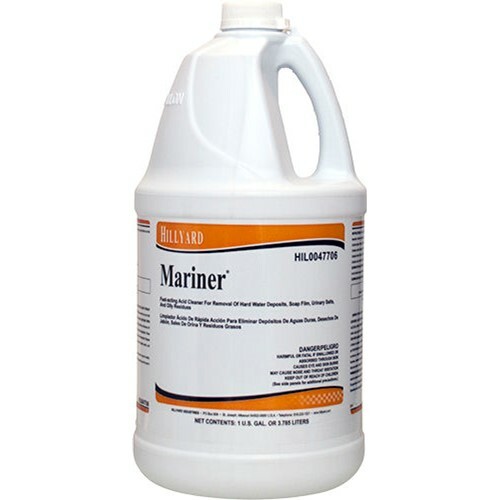 Mariner is very economical for light cleaning, and it can be mixed stronger to tackle extreme build up. It works hard to keep restroom facilities clean, and leaves behind the same pleasant floral scent. Dilution rate 2 oz per gallon. Dissolves soap film, body oil, hard water deposits, urinary salts. Can be used in restroom cleaning machines for no-touch cleaning. Leaves a pleasant floral scent. Case Specs: Four one gallon Containers per case, sold as 1 gallon.